Home » The Slavs – Early Slavic History – Where did the Slavs come from? Early Slavic history: Where did the Slavs come from? 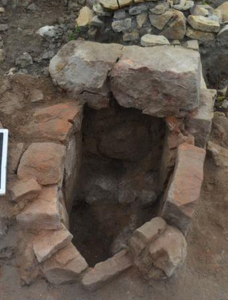 A Slavic furnace from Novae, in Bulgaria (300s AD) – maybe a pottery kiln? The Slavs, who spoke a branch of Indo-European, first moved to Europe from West Asia around 2000 BC, about the same time as the Greeks moved to Greece. Many Slavs settled in the north (probably in what is now Poland, where they may have been neighbors of the Goths). Then about 100 or 200 AD, the Slavs crossed the Carpathian Mountains into what is now Slovakia and Romania. From there, they sometimes made raids into Roman Greece. With the fall of Rome and pressure from the Avars and Huns, the Slavs crossed the Danube River, in the 500s AD, and many of them settled in Greece and the Balkans (modern Serbia, Bosnia, and Albania). Here they fought the Romans regularly over control of Eastern Europe. In the late 700s and early 800s AD, the Slavs suffered from invasions by Charlemagne, whose empire bordered theirs to the west. Charlemagne captured so many Slavs and brought them back to France as slaves that their name has become the French (and English) word for slave (the Latin word was servus, which has become our word “servant”). The Slavs captured Frenchmen in these wars too, whom they also enslaved. Their word for their slaves was “rob”, and that’s where we get the word “robot” from. In the Middle Ages, most Slavs continued to live in Eastern Europe, where they gradually divided into three groups with distinct languages. The Polish Slavs lived in the north. The Balkan Slavs lived in the south. And the Russian Slavs lived in the East. Some of the Balkan Slavs became the Czechs, but most were eventually taken over by the Magyars or the Roman Empire. The Polish Slavs and the Russian Slavs established their own empires, which became Poland and Russia. All three groups converted to Christianity before 1300 AD. When the Ottomans conquered the Roman Empire in 1453 AD, most of the Balkan Slavs also came under the control of the Ottoman Empire. As a result, some of the Slavs converted to Islam. So where did the Slavs come from? Did you find out what you wanted to know about early Slavic history? Let us know in the comments! Learn by doing: is there a Slavic festival in your town? Cite this page: Carr, K.E. The Slavs – Early Slavic History – Where did the Slavs come from?. Quatr.us Study Guides, August 2, 2017. Web. April 18, 2019. Hello Professor Carr. i apologize for my limited english. Your web site is incredible, with information conscise and value. I am History professor too. And investigator since 1978. I live in Guadalajara, México. I invite you visit my web site, is possible you find some information interest for you. Excelentes resúmenes de temas poco conocidos por la mayoría de las personas. Muy puntuales y específicos. ¡Felicidades!